The Pistons starting five now has a -37.9 net rating. Their offensive rating stands at a (predictable) 93.2, the kind of sluggish offense that many expected when the team committed to the revamped frontcourt. But we were sold a bill of goods when Josh Smith was brought aboard: a dominant, imposing front line that wouldn't let anyone near the basket. And yet after five games playing together, the team's starting rotation has a 131.1 defensive rating, a number that would sprint past the league worst Utah Jazz's team defensive rating of 110.99. Something is broken here, the root of which becomes increasingly apparent as the season wears on. It could be that the Pistons schedule presents problems for a collection of players trying to feel one another out; after wins over bottom feeders Boston and Washington, the Pistons have lost to five playoff teams (Memphis, Indiana, OKC, Portland, Golden State), many of which have legitimate title aspirations. Or it could be that the starting five is still finding a way to gel with newcomer Brandon Jennings. The team had a net rating of 6.1 in the first three games when Will Bynum was running the team rather than Jennings. But those arguments are too easy for a team being outrebounded by their opponents despite playing Josh Smith, Greg Monroe, and Andre Drummond together for 20 minutes a game. Two nights ago, the defensive rotations from the Pistons' starting five were some of the worst you'll ever see. The Trailblazers shot 11-23 from outside, most of which were corner or elbow threes without a defender in sight. Following that game with a back-to-back against one of the league's best three-point shooting teams always spelled trouble, and yet it was the 54 points in the paint that the Pistons allowed that marked their demise last night. Almost all of the problems can be attributed to coaching, either rotationally or schematically. Last night, Chauncey Billups only saw 6 minutes of action, perhaps a sign that Mo Cheeks realizes his foolhardy reliance on veterans is problematic. Billups has not-so-quietly replicated his 2012 playoff performance, where he was unable to be a functional spot-up shooting guard despite playing alongside the league's best point guard and distributor. And I don't doubt that his insistence on having the ball in his hands this year is damaging Jennings' distribution, effectively splitting Jennings' on-court time between point guard and shooting guard, and encouraging more jumpers because of the latter. But schematically, the offense looks broken. Against Golden State, the Pistons shot 3-18 from outside, which would be a surprising number if the distribution of shots wasn't so troubling: Smith 0-2, Jennings 0-4, Jerebko 0-2, Stuckey 0-2. The players that can be considered outside threats made 3 of 8 outside shots: Singler 0-1, Luigi Datome 2-4, KCP 1-3. When you allow players without an outside shooting acumen to take the bulk of the team's looks--and further when you construct an offense that encourages these players to take low-percentage shots--you need to reassess how you're running the team. Brandon Jennings/Will Bynum defense. Bynum's defense is usually something you can ignore. He takes some risks on defense, but overall, he's a consistent if unexceptional defender. But Damian Lillard absolutely torched Bynum in the pick-and-roll. Bynum wasn't able to stay in front of Lillard and was responsible for a lot of the open three-pointers as the Pistons' frontcourt was forced to rotate. Against Golden State, Jennings' defense was the sore thumb, often being caught off guard and showing a lack of consistent effort in both transition and the halfcourt. #FreeKCP. Caldwell-Pope finally got significant minutes against Golden State, both because it was the second night of a back-to-back and Billups was run off the court by the Warriors' talented backcourt. He acquitted himself as well as you'd expect: 9 points on 4-11 shooting, 3 rebounds (1 offensive), 1 assist, and two steals in 24 minutes. If he doesn't miss a fast-break dunk early in the second quarter, he suddenly has one of the most productive box scores on the team. And that box score doesn't show the multiple times KCP made great defensive plays in transition to save the Pistons multiple points. This Billups charade needs to end. Whither Josh Smith. Smith played only 19 minutes against Golden State and took only 6 shots, making one. The Pistons went small during the end of the first half and beginning of the second, giving KCP and Kyle Singler minutes alongside Drummond and Monroe. 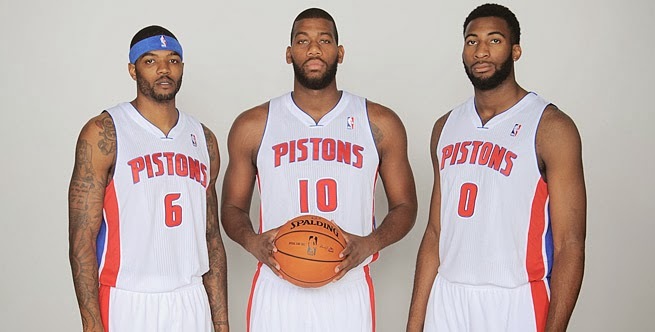 This sparked a minor comeback by the Pistons, but Smith was probably help out a little too long. After cutting the deficit to 15 early in the third quarter, Golden State pushed it back to 19. Smith likely should have returned then, but sat for another two minutes. This seems like a locker-room/effort problem that Cheeks identified. The Pistons continue their West Coast trip with games at Sacramento and the Lakers on Friday and Sunday, respectively. Both teams are Western Conference bottom feeders and represent must-wins for a sliding Pistons squad.